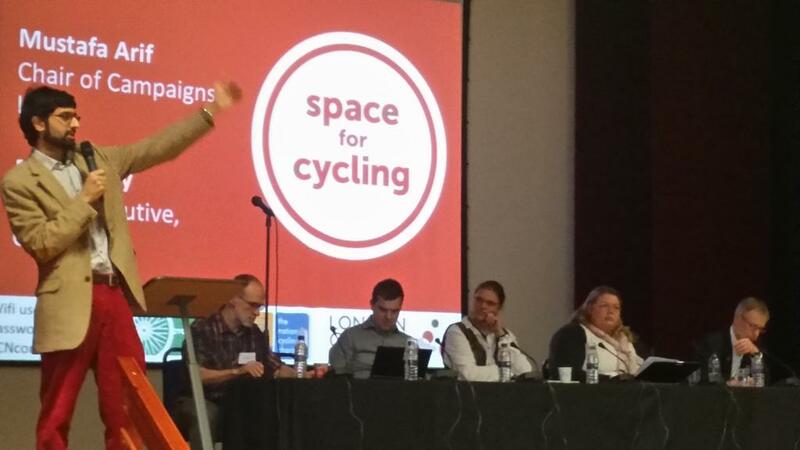 The annual Cyclenation-CTC conference 2014 took place on 22 November at Lambeth Town Hall, hosted by London Cycling Campaign. Campaigners from all over the UK and Ireland made the trip to London to share their knowledge and experience. The day started with a Cyclenation EGM which was was well-attended, and after some discussion and amendments all the motions were passed. Proposed motions can be viewed here and the amended motions as adopted can be viewed here. We now have new pages on the Cyclenation website highlighting our Vision, Purpose & Priorities and our policy specifying when Protected Space For Cycling is required. Then the conference began, introduced by Mustafa Arif, Vice Chair of London Cycling Campaign (and chair of its Campaigns Committee), and CTC's Chief Exec Paul Tuohy. Jennifer Brathwaite, Cabinet Member for Environment and Sustainability at the London Borough of Lambeth (who kindly sponsored the event) introduced the opening plenary. She talked about how to promote cycling as a normal activity. She says she can't talk about clean air, or health, without talking about cycling - it can be a solution to many of the issues councils face, and it's time it became a mainstream activity. Naomi Green, Head of Cycling Strategy at the Department for Transport, delivered a speech from Transport Minister Robert Goodwill, and presented on the Cycling and Walking Delivery Plan. Naomi's presentation. Delegates chose one of three policy workshops to attend: working with local authorities in their new duties on public health, facilitated by Lucy Saunders; working towards an inclusive cycling policy, facilitated by Rachel Aldred and Kevin Hickman; or the next steps on Space for Cycling, facilitated by Roger Geffen. All three workshops were well attended and full of useful learnings and discussion. The conference finished with a final Q&A with our workshop presenters and Cyclenation board members, talking about some of the key learnings from the day and challenges ahead. You can view London Cycling Campaign's Storify of the event here and you can download all the presentations from here. Thanks to everyone who came and to all our speakers and presenters for a fantastic day - we hope you enjoyed it as much as we did.